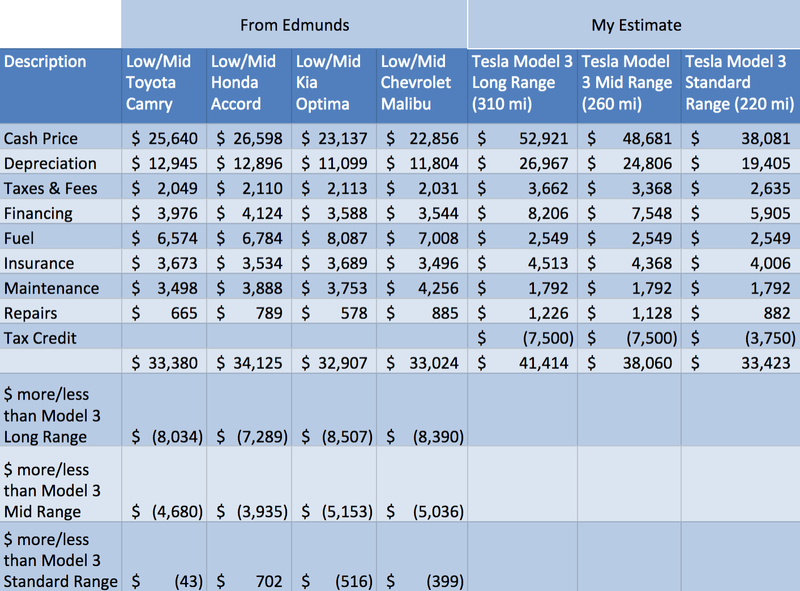 Today, I want to update my use of the Edmunds True Cost to Own model to analyze the market for mainstream midsize sedans. I’ll compare the Tesla Model 3 Standard Range to all the leaders in the midsize market today. 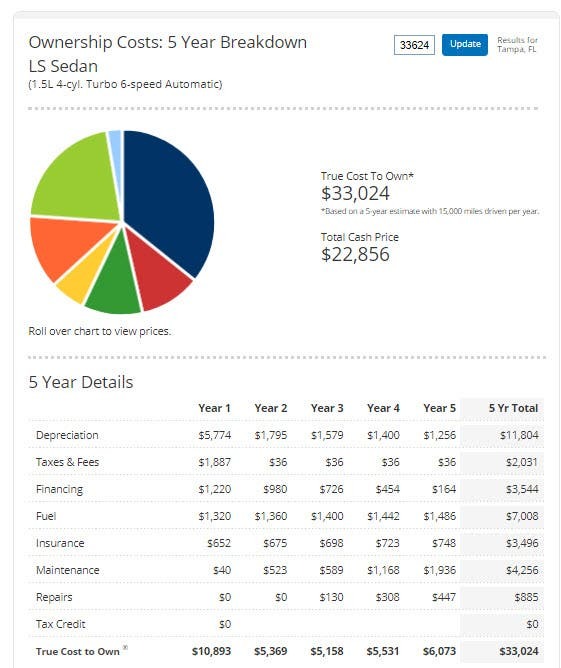 I’m using the September 2018 sales chart for midsize sedans from goodcarbadcar.net. 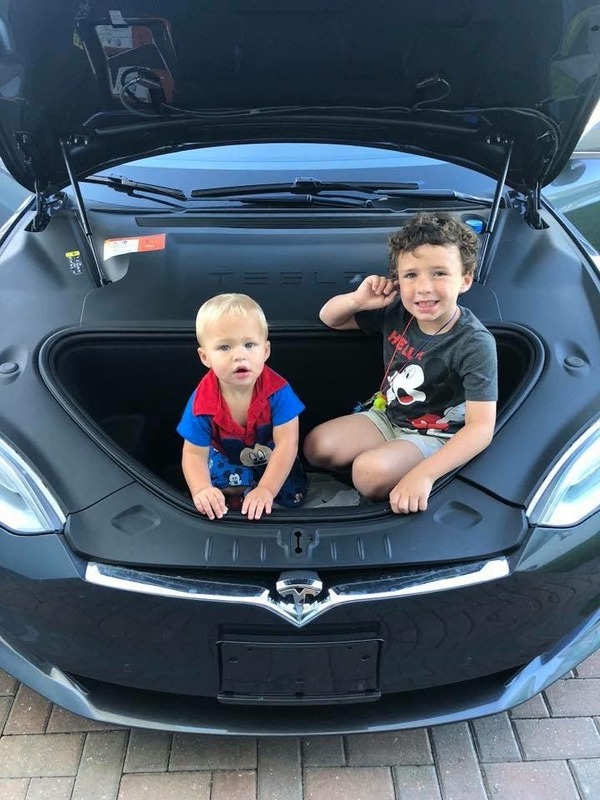 The short story, as you’ll see if you go through it all, is that the much quicker, safer, and more luxurious Tesla Model 3 can be cost-competitive with the Toyota Camry, Honda Accord, Kia Optima, and Chevy Malibu. With Ford discontinuing production of the Fusion in March 2019, it is not really going to be in the midsize sedan market, so I didn’t include it in today’s comparison. I didn’t include the Hyundai Sonata, since it is a sister to the Kia Optima. I used CarGurus.com to see the models that were the most available in my area and I went to each manufacturer website to try to match up a few features like cloth seats and bluetooth capability. Of course, there are many, many features of the Model 3 that aren’t available as options on any other car. For Toyota, I picked the Camry SE model, which is slightly more than the stripped L and LE models but thousands less than the XLE, XLE V6, or the XSE V6. Next, I picked the popular Honda Accord Sport model that is a little more expensive than the base LX but thousands less than the EX, EX-L, or Touring models. I picked the Kia Optima S trim level, which is just a thousand dollars more than the base LX model and thousands less than the LX Turbo, EX, and SX trims. Lastly, I picked the Chevrolet Malibu LS, $1,500 more than the base L model but $1,900 to $7,700 less than the more fully optioned LT and Premier models. Below, I’ve put all the figures from above into my workbook and compared the costs to the Model 3 Long Range and Mid Range available today as well as the Model 3 Standard Range scheduled to be available early next year. All of the models in my comparison (except the Model 3 Long Range) were within a $1,218 range, which is only a $20.30 a month difference from the highest cost model (Honda Accord Sport) and the lowest cost model (Kia Optima S). The Tesla Model 3 Standard Range was right in the middle of the pack at almost the identical cost as the Toyota Camry SE. The Model 3 Mid Range is approximately an $80 a month upgrade and the Model 3 Long Range is approximately a $120 a month upgrade over the midsize competitors. This comparison will surely get many people to rethink their midsize purchases. If you want more details on how I constructed my Model 3 costs, take a look at my revised TCO article published earlier. 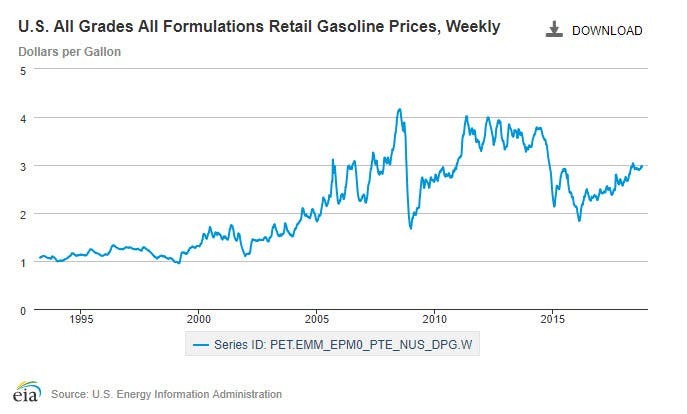 All of these calculations assume gas prices stay about where they are today, but as we were reminded last week, the price of oil can be volatile, even though we are less dependent on foreign oil than we were several years ago, thanks to the success of hydraulic fracturing. Here is another view of the growth of US oil production that highlights the debt and some of how the costs of the boom have been shifted onto others. 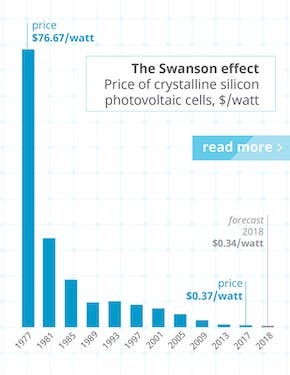 As I highlighted in my article highlighting the lower costs to fuel electric vehicles, electricity prices have been very stable and should remain stable. 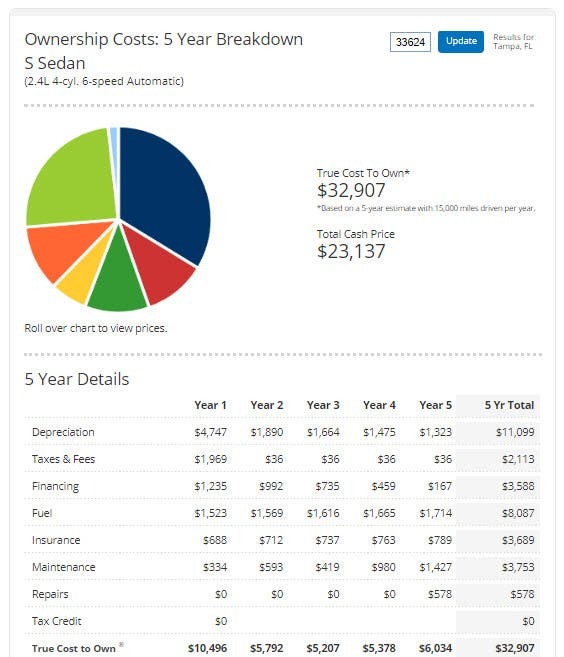 What I’m highlighting here is that, although you think the Camry/Accord/Kia/Malibu you are buying is the “safe” choice since these cars have been leaders for years in sales, history has shown you don’t really know when you purchase the vehicle how much it will cost to fuel it over its life. If gas prices spike, you will pay a heavy price if you try to trade in your less fuel efficient car for a hybrid or electric vehicle to reduce your pain at the gas pump. By this spring, many more people will have seen and possibly ridden in a Tesla Model 3. Most will be impressed and interested in this new popular car popping up everywhere. 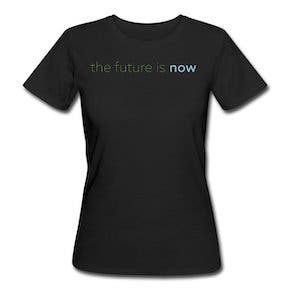 Most will dismiss it as far beyond their means. What I’m trying to show with this and other articles isn’t just that the Model 3 is as affordable as the most popular midsize cars sold in the US, but that it isn’t a risky choice, it is the financially safe choice for your family’s budget (and the physically safe choice). 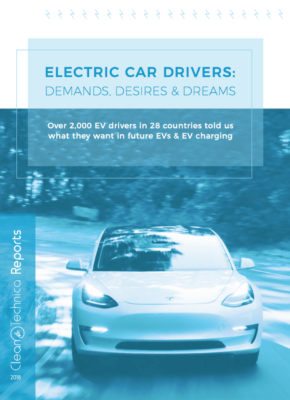 Related: What Is Tesla Model 3’s Actual Market Share Potential?